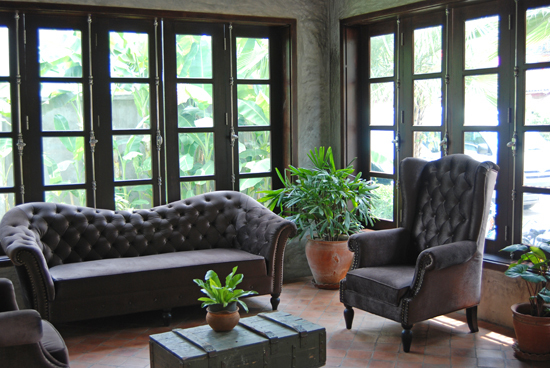 Le Sen Boutique Hotel is another new entry into Luang Prabang’s boutique hotel market, and it’s hard to find any faults. While it won’t win any architecture awards and it’s not a heritage building, it has the kind of practical, functional design and layout you’d expect from a recent build. Ad Book now! Rates from US$107.43++. Average rating 9 from 559 reviews. The small, simple but elegant lobby. The hotel is located in Ban Mano, outside of the town centre/peninsula area. It’s set slightly back from Manomai Road, a busy strip comprised mainly of mum-and-pop stores and restaurants. Past a plain facade and through a breezy lobby you come to the rooms which flank an inviting swimming pool, a big selling point for a hotel at this price. When temperatures soar between March and June, trust us, you’ll want a hotel with a swimming pool. 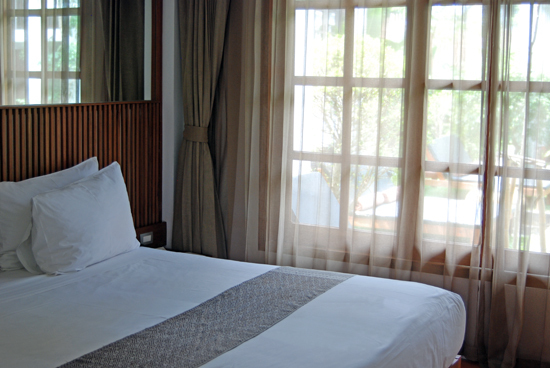 There are 16 deluxe rooms designed with clean lines and white walls. They’re simple and uncontroversial. Slatted wood and neutral beige, brown and grey tones warm up and soften the space. The bathrooms are modern, with a rain shower and good lighting (a luxury when it comes to accommodations in Luang Prabang). All rooms have their own small balcony or terrace that overlooks the swimming pool. Two suites and one villa are also on offer; the extra splurge will get you a freestanding bathtub with spray jets, a make-up mirror (yet another luxury item in Luang Prabang), a sitting area and a little more space. 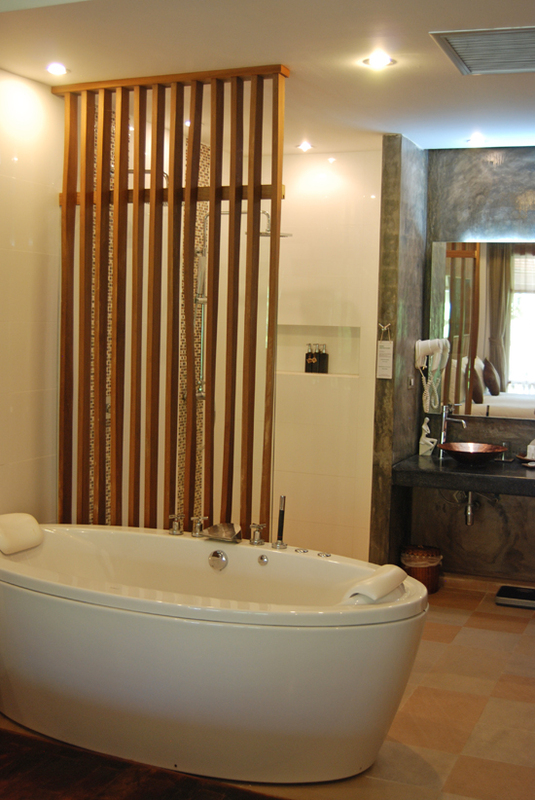 The two Suites and one Villa have a free-standing bathtub. Le Sen has a restaurant and airport pick-up is free with direct bookings. 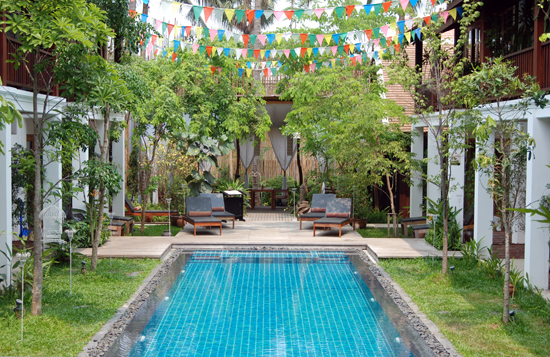 It is also one of the few Luang Prabang hotels with an air-conditioned gym. It’s equipped with stationary bikes, a treadmill, weights and a basic circuit-training machine. While it’s not impossible to walk to town – it’s a 15-minute stroll – unless the weather is pleasant you’ll probably use the hotel’s complimentary bicycles, take their frequent free shuttle or end up catching a tuk tuk. On the plus side with the location: Manomai Road has a plethora of good local streets eats, everything from noodle soup and fresh spring rolls to Lao coffee and breakfast rice porridge. If we had to find a drawback (and we’re nitpicking here), the lounge area beside the pool is small and it can feel crowded. There are no grand views from the balcony, no mountain scenery you might have dreamt about. If you have your heart set on staying in the town centre or at a spacious resort, then this hotel is not for you. But if you want clean comfort and wonderful service for not a lot, Le Sen is an excellent choice. 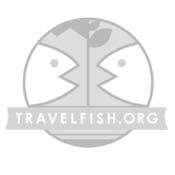 Check rates at Le Sen Boutique Hotel on Booking.com.